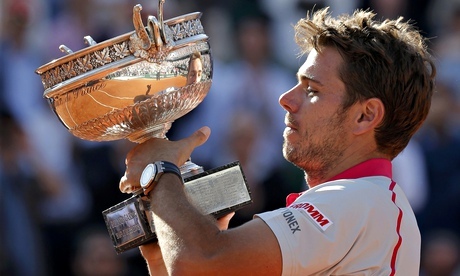 Djokovic was the strong favourite to clinch his first title at Roland Garros and complete a career Grand Slam but Wawrinka outplayed the world number one to win 4-6, 6-4, 6-3, 6-4, it means a second grand slam success for the Swiss, eleventh attempt at the French title for Wawrinka who won last year’s Australian Open. He, along with Juan Martín del Potro and Marin Cilic, is one of only three players since the 2005 Australian Open to break the major stranglehold of Djokovic, Rafael Nadal, Roger Federer and Andy Murray. the quarterfinals when he outclassed Rafael Nadal, the nine-time French Open champion, in straight sets, well not this year, but Stan Wawrinka had other plans and other weapons, and on Sunday he kept summoning the moxie and precision power required to bring the highflying Djokovic once more back to earth at the only Grand Slam tournament he has yet to win. Although in Wawrinka’s eyes he’s still not on-par with the “top four” despite his tremendous effort and performance, overpowering the dangerous Serb, with brilliant-like baseline winners, But there’s little question that the powerful Wawrinka possesses the game to beat Djokovic — or anyone for that matter. Evidence of the threat he carried came from his recent grand slam performances against Djokovic: In their previous four matches, all of them went to five sets, on Sunday Wawrinka smacked 59 winners; Djokovic hit 30 and made 41 unforced errors, Novak has now lost in the final here in 2012, 2014 and 2015 and four times in the semifinals. Wawrinka has played a lot of big-time matches in the last three seasons, winning the Davis Cup with Switzerland last November and the Australian Open in 2014. He beat Djokovic on his way to that title, winning an epic quarterfinal by 9-7 in the fifth set. He beat an ailing Nadal in the final.